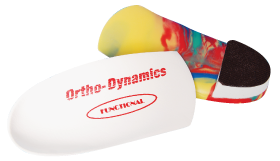 Designed for maximum biomechanical control and correction for very young, adolescent and adult patients. 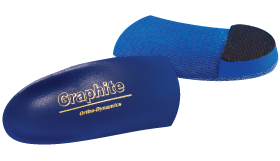 Activity: Functional rigid control with deep heel cup for subtalar control. Components: Offered in 3mm or 4mm multi-colored subortholene shell. Extrinsic 55 durameter EVA rear foot post with non-skid bottom cap. Shell top covered with layer of 1/16 poron for comfort. Available in met, sulcus or full length. Footwear: Lace shoes or athletic footwear. 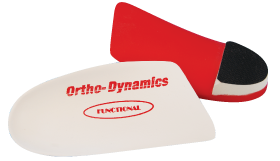 Activity: Functional control and designed to correct in-toe or out-toe gaits. Activity: Functional support and control when only limited space is available in shoe. Components: Rigid or semi-rigid composite. Extrinsic 55 durameter EVA rear foot post with non-skid bottom cap. Shell top covered with layer of 1/16 poron for comfort. Available in met, sulcus or full length. Footwear: Lace shoes, athletic footwear or slip-on shoes.